The Funky Fashion range of fun jewellery kits are designed for girls aged 7 and upwards. These kits deal with everything a young, fashion conscious girl could want - including nail art, fake tattoos, hair braiding, and several sets that are based around making your own jewellery. 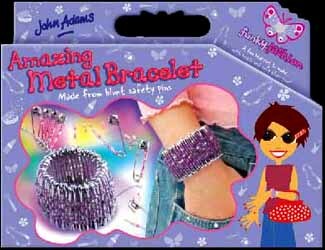 The Amazing Metal Bracelet kit allows girls to create their own metal bracelet. The pack includes two different shaped beads and a bag of blunt safety pins. All you have to do is thread the beads onto each safety pin, thread some elastic (included) through the safety pins and before you know it you've got yourself a spangly metal bracelet. The safety pins are blunt - before you start to panic - and are pretty safe. The only slight drawback is that the beads are all pink. It would have been funkier if you could mix and match a few other colours to give a more colourful look to this piece of jewellery. Otherwise, this is a pretty neat accessory to the young girl who wants to look cool.